Chitin and chitosan are the most widely used biodegradable and biocompatible materials subsequent to cellulose. Nowadays a wide range of materials, including those classified as organic, inorganic, and biological are used in the synthesis, fabrication, and processing of nanostructures with unique physical properties. The properties of the polymer significantly improve by dispersing a few percentage of nanoparticle in the polymer matrix. In this context, we are focusing on the preparation, characterization, and bioactivity of chitin and chitosan nanocomposite in detail. The morphological changes occur in presence of nanoparticle. 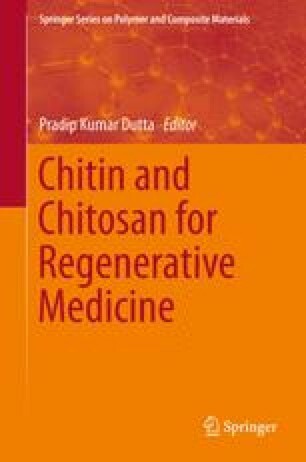 The improvement of thermal and mechanical properties including dynamic mechanical behavior of chitin and chitosan in presence of different nanofillers has been discussed in detail with suitable example as potential material for bone and wound tissue engineering applications. We summarize the physicochemical and drug delivery properties of chitin and chitosan composites. The cytocompatibility of the nanocomposites is assessed with improved cell attachment and proliferation using different human cells. This chapter enhances the understanding of biological uses of chitin and chitosan with their improved properties in presence of nanoparticles. A new approach at the intersection of biology and nanotechnology is focused to develop the next promising eco-friendly biopolymer nanocomposites. The author (A K. Mahanta) gratefully acknowledges the financial support from Council for Scientific and Industrial Research (CSIR-UGC), New Delhi in the form of fellowship. The authors also acknowledge the receipt of research funding from Council for Scientific and Industrial Research (CSIR), New Delhi, Government of India (Project No. 02(0074)/12/EMR-II).